Fungus gnats are those really annoying little flies that are commonly found in groups just hanging around our indoor plants and bags of potting mix. They are either black or dark grey and about 3mm long and just thrive in moist potting mix or soil. These critters are not benign - they can transmit diseases like pythium and fusarium. You may also see them hovering around over-ripe fruit in your fruit bowl and mistake them for fruit fly. 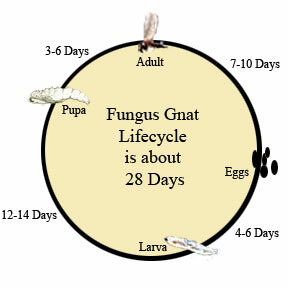 Adult fungal gnats are attracted to the decomposing organic fruit matter. The larvae can be fairly hard to see as they are so small - just 4-5mm long, white to translucent and live within the soil or potting mix. They feed on a range of organic material including plant roots, soft seedling stems and the base of cuttings. They can cause wilting and slow growth of plants. If your potting mix is infested with these critters it can make establishing cuttings very difficult as they have fewer roots and can be killed outright by the hungry larvae. 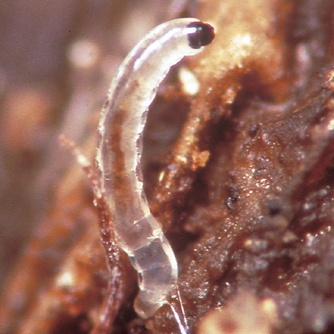 Larvae can also spread various diseases like phytophthora, rhizoctonia, verticillium and others. 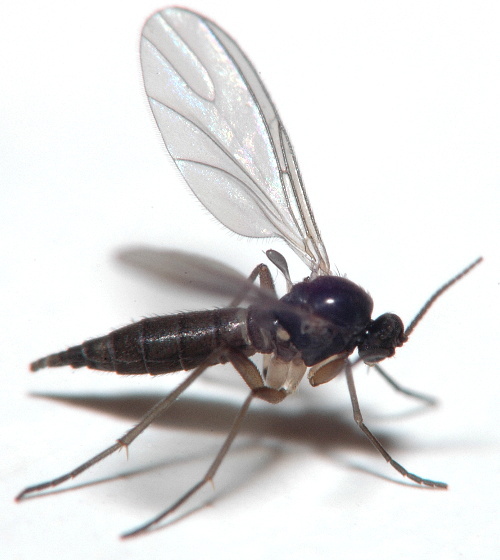 Fungus gnats can infest any soil but are most prevalent in potting mixes which are high in organic matter and damp areas outdoors. The soil in which houseplants are potted can also provide an environment in which fungus gnats can flourish, along with seedling punnets, pots with cuttings and in greenhouses. As a general rule allow your indoor plants to dry out before watering - this will kill the larval stages in the soil. In general do not overwater indoor plants, Excess watering leads to algal growth in the potting mix and on saucers which fungus gnats will also feed on. An organic control method is to apply eco-neem as a soil drench to kill larvae within the soil. A repeat application may be required as adult fungus gnats live for several days and may lay some new eggs into the soil.